Today started normal-ish like any other. Then, part way through the morning, an ever-so-slight snow began drifting down. I had to stare for a bit to make sure my eyes weren’t deceiving me. Snow has a way of capturing me, making my world slow down. This snow is one that makes you listen. The wind has stopped; every once in a while there’s a bird chirping in the distance. S l o w l y everything is getting a new coat of white. Back at my desk something caught my eye and made me smile. My orchid is blooming. 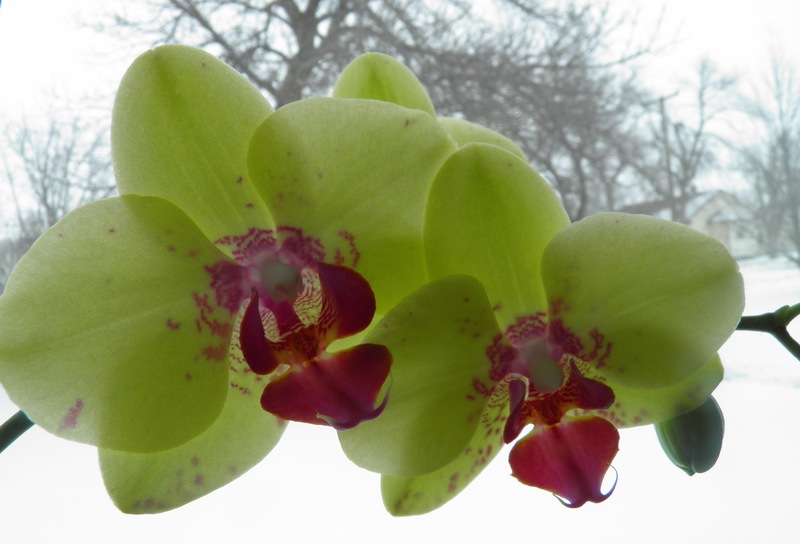 Seeing the dichotomy of orchid and snow caused my thoughts to drift toward my own seeming jumble of inconsistencies. So many of the things I love appear to be in direct contradiction. Falling snow and the warmth of a crackling fire…the rhythm of the waves and standing on a mountain top…sweet and salty…modern jazz and Gregorian chants… Maybe that’s part of the beauty and, for me, how each day is new. Gone2Pieces was born out of a need to convey this ever-changing love of nature and the cultures that surround me. I love “being various,” embracing the pieces – experiences, influences, failures and victories – that have shaped my life. I have seen how certain creativities/talents have sprung to life during different “seasons”…just when they were needed, and appreciated the most. Everything that makes up who I am and the world around me is intricately orchestrated and coordinated — designed, created with purpose in mind. Today? Enjoy the little surprises that await you. Allow yourself to be inspired.